In Cal Newport’s blog post on Digital Minimalism, he emphasizes the importance of limiting the amount of time you use online. One of his hacks is to, “be wary of tools that solve a problem that didn’t exist before the tool.” He references GPS and Google as useful tools because they solve of the problems of needing directions or finding an answer quickly, while Snapchat and Instagram do not. Newport’s post has me thinking about my own life, and how I’ve been using technology lately. While I have spent some time on Facebook and Netflix, I have also been using digital tools to answer historical questions thanks to Digital History class. the 1936 Kipona Festival using Story Maps. You can find my Story Map here. The Kipona Festival is the annual Labor Day celebration in Harrisburg that highlights the river culture of Pennsylvania’a capital. It is still running today. The festival of 1936 was the first Kipona since 1921 after it was cut due to its mass expense. The Kipona Club had been planning the festival since May, and it took place September 7, 1936. From newspapers and reports, I mapped out the locations of events throughout the day, from the air show at the beginning of the day to the closing parade and the fireworks. The sources offer schedules and comments on the events on September 7. Most are positive, amazed at the work of the Kipona Club. 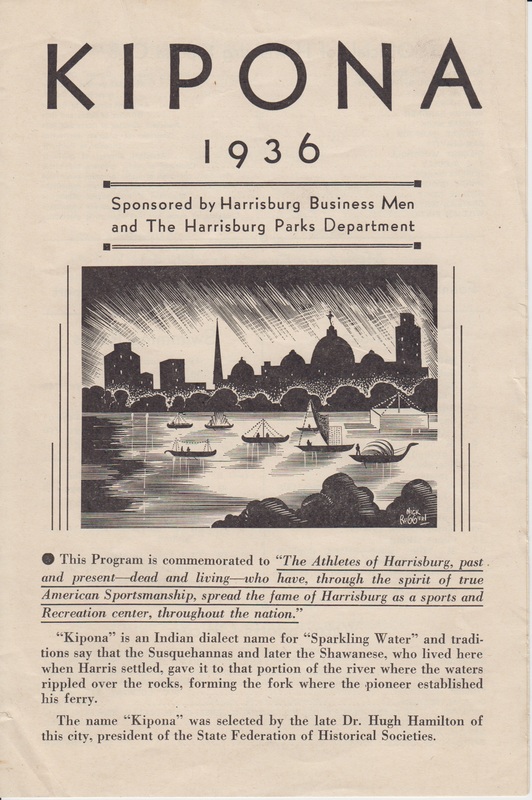 The Harrisburg Telegraph is the biggest advertiser of the festival, mainly because its owner Edward J. Stackpole was one of the leaders of the Club. Another essential piece of the Kipona Festival of 1936 was its technological advances, such as its sound system that reached halfway across the river to City Island and stretched two blocks. I also demonstrated the vastness of this audio system in my project. heavily involved, many local businesses helped to pay for the festival, from the fireworks to the new sound system. Using Story Maps, I mapped out the locations of these various businesses, demonstrating the cooperation throughout the city to make the festival a reality. According to the report, the Kipona Club gave to the Historical Society, the theme of the festival was simplicity to show how far resources could stretch to become a fantastic Labor Day tradition. According to the sources, the teamwork of Harrisburg allowed for the Kipona Festival to succeed while keeping to its theme of frugality. I displayed all of the content into a Story Map, which is powered by Esri. It is a program that allows for you to tell a narrative spatially, much like ArcGIS. Although I had heard of Story Maps in my GIS class and from other experiences, I had never actually used it until now. The Digital History class has given me the opportunity to use tools that I otherwise would never have a chance to use. I have gained great practice in blogging, research, and data analysis. All of these tools are considered transferable skills, which will help me in the future to succeed in the workforce. These new skills will help me in my career, and have solidified my decision to pursue Library and Information Sciences. The class gave me more confidence with technology because now I know that I can use certain tools, like Zotero and Microsoft Access. I also know now because of the tight schedule of J-term that even if I do not know a program or digital tool, I can learn it quickly. Digital History reminded of my love of data and organization, and am more excited about the world of archives than ever. More importantly, I have recognized the importance of the Internet in the future of history. The skills I am learning can better preserve history in the digital age, as well as preserve the digital age to be seen by the future. According to Roy Rosenzweig in his book Clio Wired, it is the librarians and archivists who are seeing the future of Internet history (38). I want to be a part of that preservation, and because of this class I have a continued hope for digital history.